James E. Bennett Orchard, located about four miles from Buffalo on Bennett Road, has been in the same family through four generations. James’ son Mike, his wife Glenda and Lula now operate the business that sells several varieties of apples and peaches as well as honey, preserves, sorghum, jellies, and jams. A LaRue County cabinet business takes pride in their creativity and attention to detail as they create original products for their customers. Walters Cabinets is a custom cabinet shop that specializes in designing, making and installing cabinets for kitchens, bathrooms, and other areas of a home or business. They also design and create a variety of other items including bookcases, wet bars, entertainment centers and much more. 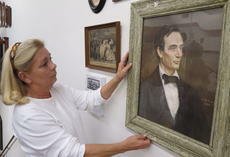 The Lincoln Museum on the square in Hodgenville, in operation for 26 years and counting, is a prime example of what can be accomplished when a community comes together for a common cause. “The idea of having a museum centered on Lincoln had been around for many years, but things were not quite right for it until several events happened in short order in 1988,” recalled Iris LaRue, longtime museum director who was serving as LaRue County Chamber of Commerce executive director in 1988. A LaRue County graphics business was created out of the idea to help school groups raise money. Create It is located on 109 Lincoln Drive in Hodgenville. Their hours are 10 a.m. to 6 p.m. Mondays through Fridays and 11 a.m. to 4 p.m. on Saturdays. The business specializes in custom vinyl graphics printing for window decals, banners, signs, clothing, license plates, blankets, backpacks and much more. 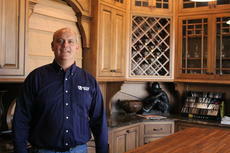 Being in the family business of selling appliances was not what Ron Hickman wanted to do for the rest of his life. “ After making a delivery, lugging a side by side up to the second story by myself, I decided this wasn’t for me.” Hickman went to school for radiology and became a Xray and MRI technician. Hickman’s wife, Karen, also went to school for radiology. “I put her through school, she put me through school” he said. Pull into their long driveway and you will see a display of fall at it’s finest. Pumpkins, gourds and squash everywhere on wagons and stands. It’s obvious the Wilmoth family loves fall. 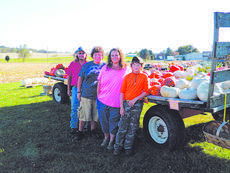 When Becky Wilmoth wanted to plant some pumpkins for fall decorating, she never expected it to turn into a roadside pumpkin stand offering 85 varieties including pumpkins that have been painted and decorated ready to display. “Lower yur ears and tan yur hide” has been the slogan of Country Cuttin’ Since 2001. 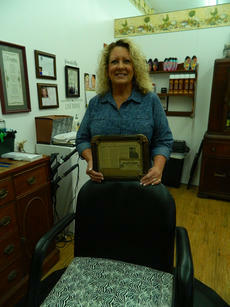 Kathy Stillwell has had an interest in styling and cutting hair since she was young. “I would cut and color my mom’s hair and I started doing hair for friends and family.” Stillwell said. Stillwell’s interest in hair stems from the struggle she had with her own hair. A LaRue County man has turned his hobby into a large graphics business. 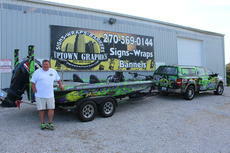 Chris Hines of Upton created Uptown Graphics in November 2006 after he wanted to have his bass boat wrapped and he had a hard time finding someone to do it. One local automotive business has been serving people of LaRue County and other surrounding counties for more than five decades. 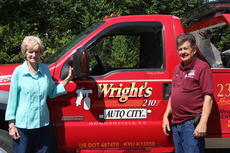 Auto City by Wright’s 210 main location is located on 1461 Campbellsville Road in Hodgenville. The business also has two more locations in Hodgenville, Parts City Auto Parts on 196 Lee Oak Drive and Auto City Service Center on 110 Lincoln Drive. Most everyone will agree that death and taxes are two inevitable truisms. But, for home or apartment dwellers another inevitable maxim can be etched in stone, stuff accumulates. “That’s why we’re here,” acknowledged Judy McGee manager at the Hodgenville office of Treasure Chest Mini Storage located at 1270 Old E’town Road. The Hodgenville store is one of three offices, with the other offices located in Elizabethtown and Radcliff. 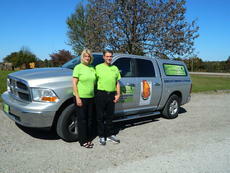 They are owned by Debbie and Jerry Phillips and operated by Mike Phillips.